Announcing a panel at Words in Winter Festival! Excited to say l will be hosting a panel of fabulous creators at the Words in Winter Festival to discuss writing for children. Featuring New York Times best-selling author Adam Wallace, author/illustrator Renee Seaman Treml and author Alison Lloyd. We’ll be talking about where ideas come from & how we write for our toughest critics – the under 10s. Come and make a weekend of it in Daylesford! Did you know September is World Dementia Month? And there’s a growing list of Australian children’s books that have ageing grandparents or other family members as a central theme. This September, I’ve banded together with other Australian authors and illustrators who also have books for children on the theme of ageing. The theme of this year’s World Dementia Month – You are not Alone – is particularly appropriate for all of our stories. What follows is a special guest blog post by my lovely fellow children’s author Debra Tidball, author of When I See Grandma. A select group of Australian children’s authors and illustrators have collaborated to showcase their books about ageing and dementia for September’s World Dementia Month. The helplessness and confusion a growing number of children face when confronted with the decline of an elderly relative prompted local literary professionals to create emotive stories to provide encouragement and hope to families. Each unique and beautifully illustrated story is based on personal experience and offers practical strategies to connect and share love with elderly grandparents even in difficult, changing, and confusing circumstances, helping grandparents to know that they are not alone. The power of memory and remembering as a way to sustain a loving connection is a common thread. In Celia and Nonna, Celia brings memories of happy times spent together with her grandmother into Nonna’s new aged care home by making pictures and paintings to fill the walls, and the grandchild mouse in Do You Remember uses artwork to honour Grandma’s memories. In When I See Grandma, Grandma’s memories are brought to life through her dreams as the granddaughter shares with her everyday things she enjoys doing and in Harry Helps Grandpa Remember, Harry shares coping skills to help his grandpa boost his memory and confidence. In Lucas and Jack, Lucas’ encounter with elderly Jack reveals to him what Lucas can’t see on the surface – the rich past of each resident – and in so doing, gives Lucas the key to connecting with his Grandpop through inquiring about his childhood memories. At times humorous, at times poignant, always heartfelt, these stories will inspire and encourage children and families who are grappling with change and illness in those they love. You have three minutes, starting NOW! We try not to jostle each other, this collection of 50 or so writers about to be unleashed on a roomful of patient publishers. But when the accordion doors are pushed back, there’s a palpable surge to the front by the keenest to get in the front of the line for their preferred target. I hang back a little; there’ll be time for everyone. Welcome to the third annual Literary Speed Dating session run by the Australian Society of Authors and Writers Victoria, held on Saturday June 20th. In this session, published authors and unpublished writers get a stressful three minute time slot with an editor. A buzzer and announcement tells people to stand up and move along every three minutes. You can line up as many times as you like; some people spoke to one or two editors, others did the rounds of several. It’s daunting, to say the least, to get the characters of a story you’ve been living with for a year or more in your head out in a short, punchy concept pitch of maybe no more than one minute, to an editor you’ve probably never met before, and to get an instant response. I consider myself a veteran of these speed pitches now. This was my third LSD event and I secured my first publishing contract out of the first one, two years ago. That night, I pitched the same story to three publishers and one agent, and all asked for the full manuscript – that was enough for me to consider the night a success. I’ve blogged about that night and my path to publishing down near the end of this blog page. This year, I came prepared with two projects targeted at two different publishers. Within half an hour, I had pitched both projects and received kind, thoughtful feedback but in quick succession, two “no”s. I had tried; I was ready to pack it in. The adreline was fading. But then, I thought, there’s another 90 minutes of pitching going on here. I sat down for a few minutes and regrouped. Then I went back into the room and pitched one project to another editor and a different story back with one editor who’d rejected my first pitch. Nothing to lose, right? And I got two maybes. There’s a danger in being overprepared. I had my two-line pitches down pat. But by being a little flexible, and pulling out another story from my top drawer to offer, I gave myself an extra chance. And probably a few more months in that sweet spot between when you send your baby MSs out into the world, and before the replies come back. We’re lucky the publishing community in Australia is small and friendly enough to participate in these sorts of events. I can’t imagine publishers in London or New York offering their time so freely. The next ASA speed pitching event takes place in Sydney in November. I was very touched to find this link last night during one of my occasional rambles through Google. 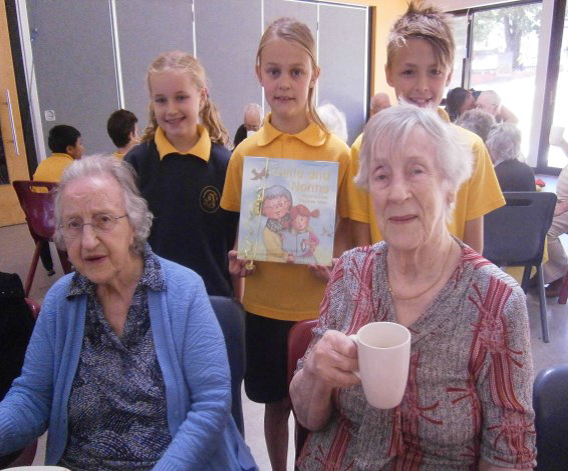 The Grade 5 students at Wandong Primary School celebrated an intergenerational program with residents of the Dianella Aged Care Home. And they shared Celia and Nonna together! What a wonderful school program to bring young and old together. I am just thrilled that they found Celia and Nonna and were able to share it — a proud moment for me to see my story at work in the community. As the summer holidays fade and we drift back to work and school, the last few chapters of a good book still percolate pleasantly through the mind. But did you take an e-reader to the beach, or a paperback? Despite all the predictions to the contrary, sales of printed books held up in 2014 and look set to dominate total book sales in 2015. Just two years ago, consultants at PwC were predicting that e-book sales would overtake printed book sales by volume in the UK this year. It seemed a reasonable guess at the time, as bookstores collapsed and e-reading devices featured high on Christmas wishlists. Instead, the popularity of the Kindle and other e-readers has waned (remember the Nook?) and the growth of e-book sales slowed or plateaued last year. In Australia, Nielsen BookScan data shows that physical book sales edged up 2.2 per cent in 2014. A study by rival consultants Deloitte released last week predicts that print will represent more than 80 per cent of all book sales by dollars and units worldwide this year. For the US, the world’s largest book market, the forecast is just under 80 per cent; 83 per cent for Canada, 86 per cent for the UK and 95 per cent for Germany. “e-books have not substituted print books in the same way that sales of CDs, print newspapers and magazines have declined,” says Deloitte’s media lead partner Clare Harding. Deloitte says that print will generate the majority of book sales “for the foreseeable future”. While in some print markets such as newspapers demand is driven by older readers who grew up with the format and inky fingers at the breakfast table, this is not the case for books. Millennials, generally averse to physical media such as music on CD, movies on DVD and news in newspapers, actually appear to be quite fond of books. Last year, three-quarters of American millennials read a print book, compared with 37 per cent who read an e-book on any device (including a phone). A UK survey suggests that some in the 16-24 age bracket like books as objects for their covers and collectability, plus reading a book on the train sends out information to others that having your eyes glued to an e-reader can’t. In the US where the uptake of e-readers was higher than in Australia, digital book sales peaked in the low 30 per cent range a couple of years ago, and have since subsided to around 20 per cent. Barnes & Noble’s Christmas sales of digital content were down 25 per cent, and device sales down 68 per cent, but it expects full-year book sales to be flat. After several soft years in Australia, print books appear to have turned a corner in 2014 and Christmas sales were also strong. “Many bookstores are reporting a significant increase in sales, it’s been a very positive Christmas,” says Australian Booksellers Association chief executive Joel Becker. “The interesting thing in the sales trend is that children’s books are forming a more and more significant portion of the market, at around 32 per cent of total sales,” he says. Over the critical four weeks to Dec 27, Nielsen figures show that Australian book sales gained 2.6 per cent by volume and 1.3 per cent by value, driven entirely by a surge in children’s books, which rose 7.6 per cent by volume and 12.7 per cent by value. In fact, the two best-selling titles for the year were kids’ books: The 52-Storey Treehouse by Andy Griffiths and Terry Denton with 232,900 copies sold, closely followed by the latest in the Wimpy Kid series, The Long Haul, by Jeff Kinney, with 221,800 copies. Sales of digital versions of those books were tiny compared with print versions. Kids and teens who read printed books may remain attached to them as they grow up. Studies on reading conclude that reading in print aids memory retention compared with reading on a Kindle or iPad, an important distinction for students. As the publishing market settles after several years of upheaval, digital-only imprints have become popular for genre fiction such as sci-fi, crime and romance — and for self-published authors, some of whom charge as little as nothing for their work. Just as the rise of the mass-market paperback in the 1940s expanded the reading market without killing off hardbacks, the rise of the e-book may have expanded the market, without signalling the end of the printed work. This article first appeared in Business Spectator. Sometimes as writers we need to push ourselves to do things we don’t necessarily feel comfortable with. I’m not talking about the content or the writing process here, but the stuff that comes after publication. The promotional side of things. Like a lot of writers, I am fairly introverted and a fairly private person. So it has been a real push for me to get up in front of rooms full of people to talk about Celia and Nonna. But I’ve done it, and it’s been so rewarding as well. A few damp eyes out there, and many thankyous from people who feel the story has struck a chord. I spent most of this week obsessing about one appearance in particular: live, on national radio. Did I mention it was live? And national? 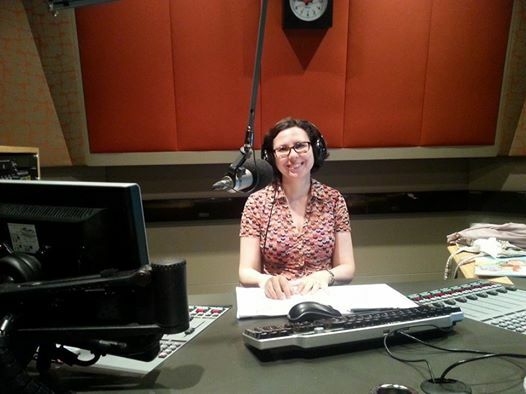 Since you asked, here is the podcast from ABC Radio National’s Life Matters show with Natasha Mitchell, a wonderful daily smorgasbord of stories about life in general. The show runs for one hour every morning, and the discussion took up more than half the show. ABC studios, live on air. I wrote long lists and short lists of points I wanted to make. As a seasoned journalist, I’m not used to being on the receiving end of pointy questions. I’m more used to asking them. So this was way outside my comfort zone. But I knew it was a golden opportunity to not only discuss the issues raised by Celia and Nonna, but also to introduce it to potential future readers who would otherwise never come across it. All up, I think the interview went pretty well. The show was set up with three guests: myself, a counsellor from Alzheimers Australia (Vic), and a young man who was 19 when his grandfather was diagnosed with dementia. The ABC billed the segment as: “How can we help children to understand dementia?” And that was spot on. With Celia and Nonna, I really hope to reach out to other families who are going through this difficult time and perhaps help to get the conversation started. So, was it worth all the personal angst in the lead-up to the show? Absolutely. I thought in detail about what I wanted to say, and wasn’t too badly thrown by some unexpected queries. I probably didn’t need to plan my commute into the studio quite so carefully, but it’s good to arrive early! Especially in this brave new publishing era, you really need to think about your book project in three stages. First comes the writing, rewriting and redrafting. The second stage is the submissions process, if you choose to go down the route of traditional publishing. I keep a long list of my various picture book submissions. And finally, you need to get out there and back your story up in the flesh. Talk to people about your book. Tweet or blog about it. Even if you just reach a few more readers, it’s worth it. My guest post for the excellent Women Writers, Women(‘s) Books online magazine is now up live! It’s a funny thing, the permanency of a book. In the past month or so, I’ve been lucky enough to hold in my hands a book that I wrote – Celia and Nonna, illustrated by Kayleen West. Lucky, because over the past few years an element of Powerball lottery has crept into the traditional publishing industry. Will your manuscript ever make it into the hands of the one editor who loves it, who finds the story resonates? And, more importantly these days, thinks she can sell it? I’ve always written for a living. I was lucky enough to have started in journalism more than 25 years ago, when it was a still a viable career path. I’ve written literally thousands of news articles in my time – I’m a wire journalist, which means working in real-time to constant deadlines (a bit like online journalism these days, except news wires have been doing it exceptionally well for more than a century). Generally, those news stories have a life span of a day or so; some features get picked up by newspapers and circulate for a week. But then, they’re gone, vanished: the electronic equivalent of fish wrap, only nobody uses inky paper for wrapping fish and chips any more. I stopped collecting my press clippings when I left newspapers, around 20 years ago, and I’m not even sure where those scrapbooks ended up. Imagine the thrill, then, when a whole box of Celia books arrived recently. Hardback copy after hardback copy, with a faint new book smell and cardboard inserts to prevent the ink on the beautiful endpapers from smudging. And heavy! We needed an extra suitcase to shlep these advance copies up to Sydney for the launch at a conference of SCBWI, the Society of Children’s Book Writers and Illustrators. After years of seeing my work disappear into the ether, it has been uniquely satisfying to see at least one story set down roots and grow. So how does one transition from journalism to children’s writing? Well, I am still on that journey and still have my day job. For me, the renewed fascination with kid lit began when my first daughter was born, nearly 10 years ago. We were living in New York at the time, and there was no better place to spend below-freezing winter days than tucked inside the giant Borders store on Columbus Circle, together with friends from my moms’ group. I fell in love with the deceptive simplicity of many new children’s books, which masked an underlying brilliance (think million-seller Peek-a-Who, by Nina Laden), and the comfort of returning to reliable classics from my childhood in the ‘70s, such as The Very Hungry Caterpillar. After about a year of writing, I began submitting, mostly through the slush pile. My successful pitch for Celia and Nonna came at a speed-pitching night run by the Australian Society of Authors, where I met my publisher at Ford Street Publishing – but that’s another blog story. Celia and Nonna is a story close to my heart. It grew out of a time in my life when I had both elderly parents to help care for, and young children as well. The starting point of the story was that sense of nostalgia, or loss, for all the lovely things that Celia and Nonna used to do together. Memories play a central role in the book – both for Celia and for Nonna. I’m sure many of us either have strong memories of our grandparents, or watch our kids with our own parents, and wish some of those moments could last forever. They were the most difficult years of my life, but I hope this is a story that will last. http://www.alexfairhill.blogspot.com.au/ … Meet Victoria Lane – author, finance journalist and gospel chorister. It’s a funny thing, the permanency of a book. In the past couple of weeks I’ve been lucky enough to hold in my hands a book that I wrote – Celia and Nonna, illustrated by Kayleen West. Lucky, because over the past few years an element of chook lotto has crept into the publishing industry. Will your manuscript ever make it into the hands of the one editor who loves it, who finds the story resonates? And, equally importantly, thinks he can sell it? I’ve written literally thousands of news articles in my time. I’m a wire journo, which means working in real-time to constant deadlines (a bit like online journalism these days, except news wires have been doing it exceptionally well for more than a century). Generally those news stories have a life span of a day or so; some features get picked up by papers and circulate for a week. But then, they’re gone, vanished: the electronic equivalent of fish wrap, only nobody uses inky paper for wrapping fish and chips any more. I stopped collecting my press clippings when I left newspapers, around 20 years ago, and I’m not even sure where those scrapbooks ended up. Imagine the thrill, then, when a whole box of Celia books arrived recently. Hardback copy after hardback copy, with a faint new book smell and cardboard inserts to prevent the ink on the beautiful endpapers from smudging (more on those end papers another day). And heavy! We needed an extra suitcase to shlep these advance copies up to Sydney for the launch at a writers’ and illustrators’ conference. After years of seeing my work disappear into the ether, it has been satisfying to see at least one story set down roots and grow. Celia and Nonna is a story close to my heart. It grew out of a time in my life when I had both elderly parents to help care for, and young children as well. The starting point of the story was that sense of nostalgia, or loss, for all the lovely things that Celia and Nonna used to do together. Memories play a large role in the book – both for Celia and for Nonna. I’m sure many of us either have strong memories of our grandparents, or watch our kids with our own parents, and wish some of those moments could last forever. They were the most difficult years of my life, but I hope this is a story that will last. but have you heard of Literary Speed Dating? 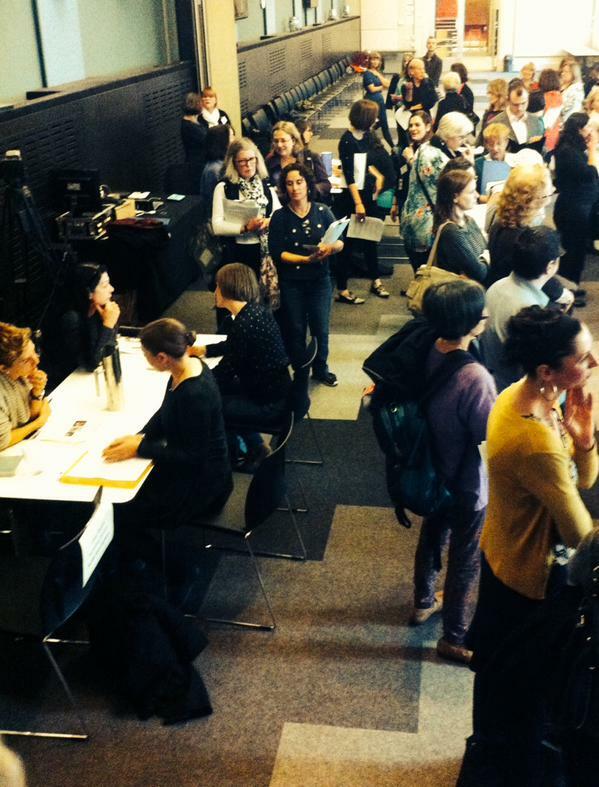 At last year’s Australian Society of Authors literary speed dating night, I pitched to three editors and one agent. It was a noisy, crowded, hectic event, with overhead screens counting down the minutes on each five-minute session. I remember feeling as though I was losing my voice after the first pitch conversation. And yet all four of those editors and agents asked me to send through a full of the manuscript – hooray! I was pretty happy with that outcome and wasn’t sure if I would hear anything further, but at least I had piqued their interest. That was in February 2013. Within a couple of months, I had had some encouraging emails from one of those editors. I got on with my life – writing, work, kids and family – and kept a little hope tucked away in the back of my mind. I knew that the path to publishing can be long and arduous, and that 25 years in journalism didn’t count for much in my favour. Then, one Friday evening in May 2013, an email from the same editor landed containing the grail: the offer of a contract. Fast forward to now, and my debut picture book Celia and Nonna is off at the printers and will be published by Ford Street Publishing on September 1. I am so grateful to the ASA for setting up last year’s event. Unpublished authors rarely get the chance to meet directly with editors, and those five minutes are gold. So use them well. Take a deep breath, and don’t speak too fast. When you only have five minutes to present your story/novel/essay idea, the temptation is to pack too much in. Don’t relay the entire plot, or reveal just how many years have gone into the making of your masterwork. Keep it short, maybe a few sentences, and be ready to have a conversation with the editor or agent on the other side of the desk. Have one or two questions prepared and be able to answer unexpected queries from their side. Last year, one editor asked me what other stories I had up my sleeve. Luckily, I had my one-line pitches ready for those books as well. I’ll be back again at tomorrow’s pitching session, with a couple of new manuscripts and fresh hopes that my stories will resonate with just one of the editors generous enough to give up half a Saturday to listen to emerging writers. For all of you preparing to pitch, I wish you the best of luck. Hi Victoria. I wish I read this post before the pitching session yesterday. I initially thought we had 5 minutes, as that’s what they told me in the email. So I prepared a 3 minute speech, and woe my surprise when I only had 3 minutes or less (the person in front was about 30 seconds late leaving their seat). I tried to squeeze everything in, and it sounded like a hurried mess. Lessons learnt for next time. Hi Maxim, I was expecting five minutes as in the email as well. I didn’t really have a spiel prepared, but I think three minutes was really a bit rushed. Good luck for next time. Thanks Victoria. I’ll be there tomorrow too. I’m already published but feel like I’m going back to the beginning again. Very exciting! I have been practicing my spiel on my friends this morning. I would have liked to have seen more agents there. The very best of luck to you tomorrow. Great post, Victoria – and congratulations on your publishing deal! It’s so encouraging to hear a success story – I’m going to the speed dating in November and am frankly terrified! The advice you gave was great.